Ca'Pietra Tiles. 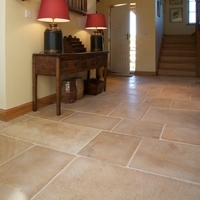 Bourne Limestone Distressed Floor tiles. These warm flagstones are full of natural character, enhanced by a hand-worked distressed finish. This stone is excellent value for money and so hard-wearing that it has been used in commercial and exterior applications.